Is this what passes for recovering from Who Do You Think You Are Live? Far from ‘recovering’ from Who Do You Think You Are? Live, it has been busy busy yet again with Swords and Spindles taking off and numerous talks in the pipeline. Great to see we made the official Who Do You Think You Are press release photo gallery. Last week I paid a visit to a local U3A family history group, who I join periodically to trouble-shoot and encourage. They had changed their meeting place since my last visit, to a ‘village hall next to the Methodist Church’ in a small village. Said village hall not being immediately obvious on my first pass down the street (there was only one street – or as it turned out – two), I asked someone who knew – or in fact didn’t. Trust me to picked the one dog walker in (insert the name of a very small rural village here) who was unable to distinguish an Anglican church (and associated church hall) from a Methodist Church and neighbouring village hall. Then a wonderful seventeenth century day at Poundstock Gildhouse but I will leave Mistress Agnes to write of that for Swords and Spindles. I have also spent time try to convince cruise line security that seventeenth century medical equipment does not represent a threat to life and limb. I expect Mistress A. will wax lyrical about that too. The usual history fest continued with helping to present a Hangout-on-Air on migration for The Society for One-Place Studies, a world war one research workshop for our local history group and final tweaks to my presentations for Ontario Genealogical Society’s Conference. Now to finish my new working women presentation before another trip to the seventeenth century tomorrow. It is our Braund Society reunion this weekend and I have to manage to be in two places at once as I am venturing to Plymouth for Plymouth Local Studies Day – actually I think I will solve this by sending Mistress Agnes in my stead. It has occurred to me that anyone looking at my internet search history would think me decidedly dodgy. This week has seen my strange Google (other search engines are available) requests range from ‘Victorian Prostitutes’ and ‘urology and astrology’ to ‘female chain makers’. Such is the variety of life! Day three and a slightly more leisurely day is in store. The first two hours I got to sit down, as I did my ‘being an expert’ stint. I fielded queries about non-conformists, about lost relatives, who seem to have been incarcerated in asylums and someone who went to school before they were born! Then there was the Waterloo veteran who wasn’t and the inevitable Smith family member, lost in Birmingham. Said Mr Smith was a sausage skin manufacturer – got to be today’s favourite occupation! I even found a missing marriage where one of the witnesses was a member of my one-name study. Next, good to catch up with one-place studiers – more sitting down – this can’t be right. Then it was Mistress Agnes time again. Today she was jilted by Master Christopher and went alone to help on the Unlock the Past stall. Finally Master Christopher, in C21st guise, accompanied Mistress A. round the arena to get photographs with Captain James Braund. Captain James is about six inches tall and is a travelling ‘person’ (I daren’t use the word ‘doll’) who has been round the world several times and crops up here and there to encourage members of our one name study. He even has his own blog. At the time, it seemed a good idea to photograph Captain James with antiques’ expert Eric Knowles in the background. Much to Mistress Agnes’ mortification, Master Christopher decided that it would be a better course of action to approach the great man himself (that would be Eric Knowles not Captain James) and get a proper photo. Eric Knowles then proceeded to ‘date’ Mistress Agnes. For the sake of clarity, it should be explained that this means he gave an assessment of the era from which she came. He was absolutely spot on, which says much for his knowledge and for the authenticity of Mistress A’s garb! Embarrassing though this may have been, I guess it would have been worse if Master Christopher had asked for a valuation! Grateful thanks to Mr Eric Knowles – what a gentleman! The day dawned and we were off for another round of chatting and meeting friends, together with rather too much standing up. Sadly I don’t seem to have managed to listen to any talks this year – the ones I’d like to hear mostly seem to coincide with stall duties or my own sessions. Without wishing to harp on about feet, I must mention that one advantage of listening to talks is that it does at least provide an opportunity for sitting down. Of course there is much to be learnt as a bonus! I began by spending a short time on the Methodist Heritage stand. This weekend has seen the launch of the MyBibleChristians community website with which I have been involved. Then some surname look ups for The Guild of One-Name Studies and suddenly it was time for my own presentation on Early Twentieth Century Communities. Where did that four hours go? No error with the title of this session and it was very gratifying to have another full house, especially as I was billed against some big names. I was in Studio 2 this time and here there was much less problem with the sound. Always great to enthuse about that special brand of research that is One Place Studies. Time then for another transformation into Mistress Agnes. After yesterday’s queues for the facilities, I had decided to use an alternative ‘rest room’ (why are they so called? – no one was resting) outside the main arena. Having left my speaker’s pass right up the other end of the hall, on my way out, I had my hand stamped with a smiley face, in order to be allowed to re-enter. I travelled back in time and realised that Mistress A. needs hose (or in C21st terms – socks) under her never very comfortable latchets (that’s shoes to you modern types). Have I brought socks with me? Inadvertently, no I have not! Bare feet, especially feet that have been stood upon for two long days and latchets are not a comfortable combo. Smiley faces on one’s hands are not Mistress A.’s style so I start to wash it off and then realise that, if I do, I will not be able to get back into the auditorium! Just in time, I manage to retain enough of the smiley face to assure my readmission. Great to meet some of the ladies who have been working so hard on my memories of 1946-1969 project over the past year. Their role is nearly over now and I think some are already getting withdrawal symptoms. More time spent promoting Unlock the Past cruises and booklets in the afternoon. I also seem close to agreeing to take on yet another task – heigh ho – ask a busy person and all that. Back to the van to discover that my website has had one of its busiest days ever, thanks to an ‘anonymous’ review of yesterday’s talk, that has appeared on Celtic Connections Blogspot. Many thanks anonymous, much appreciated – you know who you are and so do I! 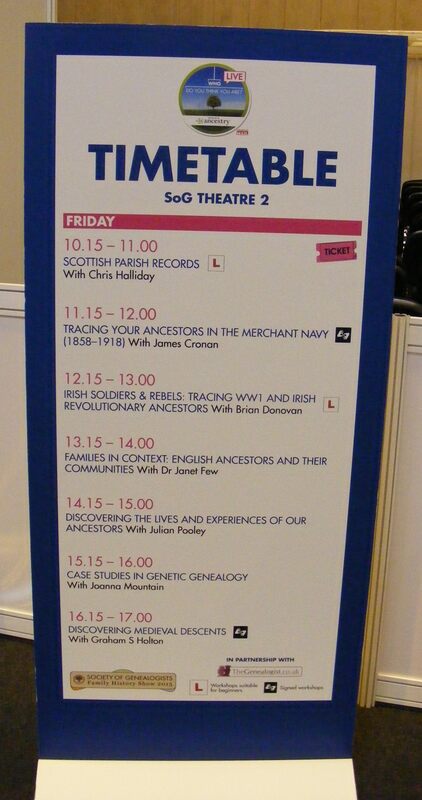 Day one of Who Do You Think You Are Live show today, now relocated to the NEC. We leave our caravan in good time to run the gamut of rush hour traffic and arrive in a car park some considerable way away from the NEC. I should stress that we have an exhibitor’s car parking permit but ten minutes’ walk away is as good as it gets. Our impending visit to Russia means that we have been advised to be injected to protect ourselves from Hepititis A. Ever law abiding, we have just done this, meaning that we each have an arm that hurts when you try to carry anything heavy. We have books, seventeenth century regalia and other precious possessions to transport. There is a shuttle bus but we have form for taking trollies full of books on public transport, so we opt for walking. On arrival, I do a reccy of where I am to be speaking and the helpful tech guy loads my presentation on to the lap-top. I start the rounds of saying hello and showing my face at the four stands where I have a connection. Great to see copies of my ’Til Death us do Part: causes of death 1300-1948 book for the first time. Then it was time to give the talk that was actually not about creating your family. 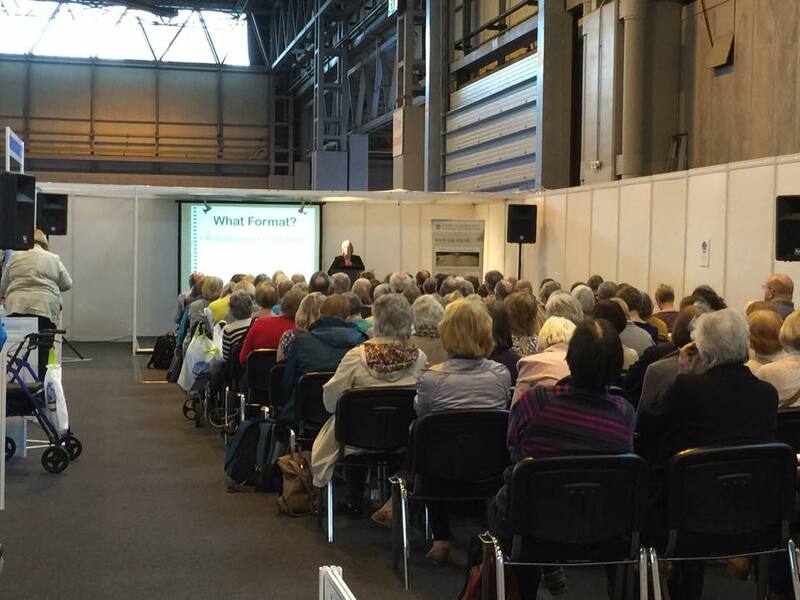 Pleased to find that the capacity audience did not all walk out when I explained the mistake. I was speaking in studio 4. For those who have never been to these events, ‘studio’ is somewhat of a misnomer. It basically means a screened off part of the arena. The problem with studio 4 is that it is dangerously near to studio 3. The decidedly weird headset and the PA system to which I have been wired-up means that you can’t hear what you are saying. To make matters worse every word uttered by the speaker in studio 3 is loud and clear; it is interesting and makes it very difficult to focus. After a few minutes I have learned to zone out studio 3 and my session seemed to go well. Then it was time to give way to Mistress Agnes and I hasten to the ladies to make the transformation. The queue is probably the longest I have seen since I went to a pop festival in Hyde Park in the 1970s. If I wait at the end of this Mistress Agnes will not be putting in an appearance toady. I shuffle past all these ladies, many of whom have crossed legs, muttering ‘I am not going to the toilet, I am just getting changed’. I then entertain the queue by struggling in to shift and bodice whilst squashed between wash basins and hand dryers. Mistress Agnes and Master Christopher attract a fair bit of attention from the show’s official media types, still we don’t do this to keep a low profile. 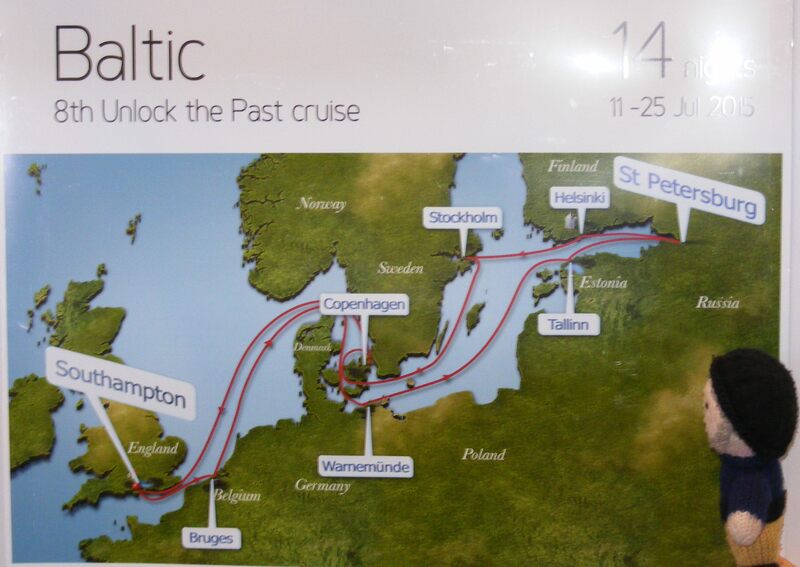 Spent some time on the Unlock the Past stand, advertising our Baltic cruise. After eight hours on our feet we call it a day but of course we get to do it all again tomorrow. Back to the van to find a Swords and Spindles’ booking in my inbox – busy times. The other day, my attention was drawn to the fact that my Thursday session for Who Do You Think You Are Live, entitled ‘Are you Sitting Comfortably? : creating your family’s story’, had been billed as ‘Are you Sitting Comfortably: creating your family’. This wasn’t quite the session I had planned. Offers of help came in from volunteers who had heard that some of my sessions involve audience participation, tickets began selling like the proverbial hot cakes. So much so, that advance tickets have sold out, although it may still be possible to pick some up on the day. I pondered over re-writing my introduction – ‘When a Mummy and a Daddy love each other very much…….’ I have now decided that some people might actually be expecting the originally intended session, so, sorry to disappoint but it has now been corrected to ‘Creating your family’s story’. I have been marooned in my house all week, probably not any bad thing given the number of writing tasks I have on the ‘to do‘ list, which is rapidly assuming the proportions of a three volume novel. According to the Highways Department, the people who have closed the road that runs immediately past my house, in order to create large holes in it, have to leave me a way to get in and out of my drive. They do? What the road-digging types have not allowed for is the fact that my drive is barely wider than my car, so I need to be a long way across the road before beginning to turn, in order to avoid leaving my paintwork on next door’s wall. Pulling forward the required amount will take me through some attractive looking yellow barriers and probably in to a newly dug ditch. Men in high-viz jackets assure me that they will move said barriers and any stray heavy machinery in the vicinity, if I need to leave home. I have yet to put this to the test, or to see how I am supposed to negotiate the ditch. 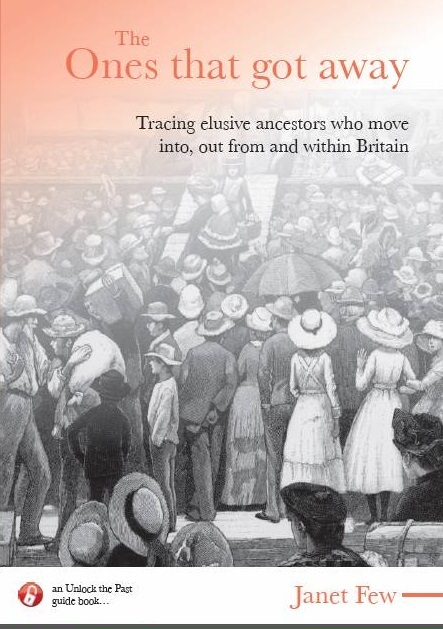 I have finally managed to finish my booklet about elusive/migrant ancestors and the publishers have sent me a draft cover in record time. Looking forward to seeing the finished article. This is another that will be available digitally and in book form. More on publications:- It has been my pleasure this week to prepare for printing a booklet written by someone else. This is the enlarged and updated history of a local chapel. Watch this space for news of its publication Buckland Brewer fans. 2 Comments Posted in Uncategorized Tagged Publications, Who Do You Think You Are? I am just starting to catch up following the Guild of One-Name Studies conference at Forest Pines Hotel and Golf Resort. Which I followed up with the enjoyment of Granny activities. I came away from the conference with loads of new ideas and inevitably, little time to put them in to practice. I was on ‘meet and greet’ duty, a great opportunity to say hello to long-standing friends and to get to know those whom I had not met before. The programme was hectic, with plenty of learning opportunities. First a session from Laurence Harris of My Heritage on ‘Collaboration, Cooperation and Communication’. I got on my soap-box and expressed my long-held reservations about ‘matching’ on commercial family history data providing websites. The resulting mega trees may be something to boast of but where is the merit of having a billion individuals on your un-sourced pedigree, about whom you know nothing? Many of these links are probably incorrect in any case. This quantity over quality trend is not part of the hobby that I recognise as family history. Later I had the opportunity to chair Tessa Keough, who was encouraging family historians to learn more about techniques and context via webinars, online courses and other means; if only everyone would take her advice. Then I was acting as chair again for a session by Alan Moorhouse about the use of Facebook, something else I would advocate. Apparently 19% of the world’s population are on Facebook. Isn’t it just typical, this was the weekend that we lost an hour due to the clocks going forward. Difficult enough for me to stay up late to socialise at the conference banquet under normal circumstances but minus an hour as well…. Sunday morning brought the usual ecumenical service. Unfortunately we lacked a keyboard upon which to play hymns. The venue were very obliging and offered to source one for us and to their credit they did – just a shame it was a computer keyboard! I presented my interactive session on publishing options. For ‘interactive’ read – I have to keep quiet, whilst the audience do all the work. These sessions seemed to go very well and there was some very positive feedback following mine. Then a very interesting, information packed session on DNA from Maurice Gleeson. All great fun and next week many of us get to meet again at Who Do You Think You Are Live. After two years’ worth of trolley disasters (see blogs for February 2014 and February 2013) we have vowed not to take a trolley this year. I have been looking forward to my participation in the Unlock the Past Genealogical Baltic Cruise. This week saw me spending a small fortune on shore excursions and booking an appointment for a Hepititis A injection (recommended apparently for visiting Russia), whilst my partner in crime rescued our foreign currency from a windy Morrison’s (other supermarkets are available) car park. Now to decide whether or not I really need a ‘beverage package’ and to ponder the advice to take a ‘cocktail dress’. Cocktail dress? I barely recognise the word ‘dress’. I wonder if a seventeenth century version would suffice?